Royal Hamel shares clearly how we can overcome our fears and, with confidence, make evangelism “mission possible” for the most timid among us. Royal Hamel has sounded a trumpet blast to the whole body of Christ. This book is a piercing clarion call, rousing believers to take up their God-given responsibility to share the gospel. Hamel spells out the under-lying reasons for our lack of witness and gives practical, compelling insights into how Christ-followers can successfully engage their world with the good news of Jesus Christ. This book is a “must read” for every Christian. In a comprehensive yet liberating fashion, Royal Hamel confronts our fears, misconceptions, and excuses and gently dismantles them. 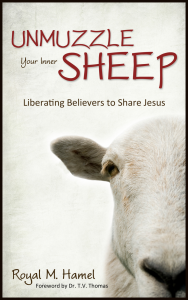 Unmuzzle Your Inner Sheep opens up biblical truth and is illustrated with numerous real-life examples. It is a must-read for believers desiring to become disciples! This book is carefully designed to engage both the casual reader as well as the serious Bible student. As a senior pastor, reading through Royal’s book made me realize I had found an excellent small group resource to help equip our church pursue our vision of “developing fully devoted followers of Jesus.” Without a doubt, this book will be a valuable addition to any leader’s discipleship tool kit! Royal Hamel calls attention to a vital component in the church which has for too long been neglected and ignored, namely, the call to evangelism. Hamel reminds the reader that evangelism is the task of every person who names the name of Christ and claims to be his follower. The present state of the church in our day is one of extreme apathy and inactivity. Hamel challenges the Christian reader in light of this reality, to rediscover the area of evangelism afresh from a firm biblical foundation. I would recommend this book to anyone who has a passion to share Christ. Royal Hamel has written a realistic and truly motivating guide for anyone who wishes to share the good news of Jesus Christ with the everyday people in his or her life. So much of what he sets forth is “battle tested” and flows out of his daily personal practices. As a pastor, I plan to use this book as I train people in my congregation to share their faith with others. Inspiring! That’s how I describe Unmuzzle Your Inner Sheep. I rejoice that my friend Royal has decided to write this book. His stories always motivate me towards witness, since they are just ordinary everyday encounters from an intentional disciple maker. I know Royal as a man on mission. This is why he and his wife, Linda, equip the church through Talk the Walk workshops, designed to inspire even the most introverted person to be missional. We greatly benefited as a church, when we hosted their workshop for our people. What Royal shares with us works! He offers every believer the theology and praxis for an exciting life lived to the glory of our King Jesus.